Generating valuable content is one of the most critical aspects of ranking well in search results, and it will help you achieve inbound links and generate more leads. Depending on the size of your company, your content plan will vary, but a good goal to aim for is producing five small content pieces each week (one per business day) and one large content piece per month. 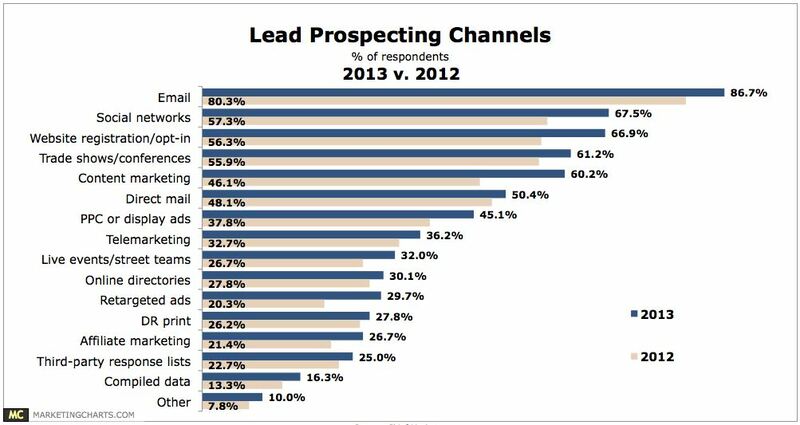 You see on the chart below that content marketing is one of the fastest growing lead prospecting channels. Why? Because it works! Small content includes things that can be produced relatively quickly easily - but don’t forget to edit! - by a number of different people within your company. These include articles, announcements, interviews, blog posts, or employee videos. Large content pieces are those that are more labor intensive, take a team to create, rather than an individual, or require you to outsource to a professional for development. These may be whitepapers, ebooks, podcasts, professional videos, or infographics. Blog Posts: One of the most versatile forms of content, blog posts are great for telling stories, establishing expertise, and developing your brand personality. Articles: Any information that you want to share about your company, products, or industry can be written as an article and posted on your site. These are likely to be the core of your permanent website content. Announcements: These are extremely valuable for highlighting current events and keeping both customers and employees up to date, or even spreading the word about an upcoming event within your company. Interviews: An interview with your manager, CEO, or any other employee is a fantastic way to show your company’s human side. An interview with an expert in your field is a perfect way to demonstrate reliability by showing that you company is still learning and improving. Podcasts: An audio podcast can easily reach people who prefer to listen rather than read. Podcasts can build a fanbase by entertaining and informing listeners who will happily share your content. Video: Perhaps the most engaging or all content types, video be an interesting twist in content or be used to increase website traffic. A video on what goes on behind the scenes at your company can build trust, while one made to entertain can draw more visitors who may become profitable leads. Infographics: One of these once in a while is likely to increase sharing and inbound links and is a great way to present any data with facts and statistics, especially original data collected from company research. Ebooks: To share more information, an ebook can include pictures, graphs, and formatted text. They can be offered on your site for free, as a download, or in exchange for contact information on a landing page. White Papers: Similar to an ebook, these are more technical, and often include detailed data about the benefits of a particular product or service. We're not saying that this is easy...it's not. But, if you are interested in getting more leads through your website, improving your SEO, and just having an all around great website that provides great value to the readers, you should definitely do it. Don't know where to start? We'd be happy to help...click this link to contact us.